Spanning 10 days, from April 17 to 26, 2011, Keiichiro Shibuya produced a piece called ‘Massive Life Flow’ at koko gallery in Ebisu, Tokyo, during an open studio event. After Shibuya dragged his piano and computer into the gallery, onlookers were free to watch and listen in on him composing and playing. The experiment gathered a lot of attention, as it was broadcast live on the Internet via a surveillance-like camera. The 82-minute recording of the performance features a total of 18 songs, including improvisations, intimate renditions of well known and unreleased works, never before performed live and unavailable on CD, as well as footage of Shibuya composing and close-ups of his piano play. Furthermore, the DVD is a document of Shibuya’s collaboration with up and coming creators, like Shohei Shigematsu (architect), Kaie Murakami (art director) and Shin Suzuki (photographer). In April 2011, I engaged myself into a peculiar project that could be described as a ten-day open studio music production, defying the mood of self-restraint that permeated society after the 3/11 Tohoku Earthquake. During this project, titled ‘Massive Life Flow’, I crammed a piano and a computer into a gallery, with people coming and going, free to have a look and listen in on me silently composing, performing or writing e-mails. It turned out that the experiment had impacted me deeply. Only a fine line remained between the personal and the public, and things outside my own control inevitably inverted the two. Similar to the theme of life and death, we find ourselves utterly powerless facing this inevitability. Also, these performances differed greatly from usual concerts and recordings. Playing music in order to explore, experiment and verify, is an irreversibly personal moment, in the sense that you are playing for no one but yourself. It comes close to real freedom. I thought about how great it would be to someday be able to actually play a concert in that same way, and as it turned out, someday I actually would. However, I decided before that as far as my work goes, I would hand it down as a personal record, true to life and with nothing to hide. Finally, even after three years, I’m still surprised at how interesting this recording event has been. 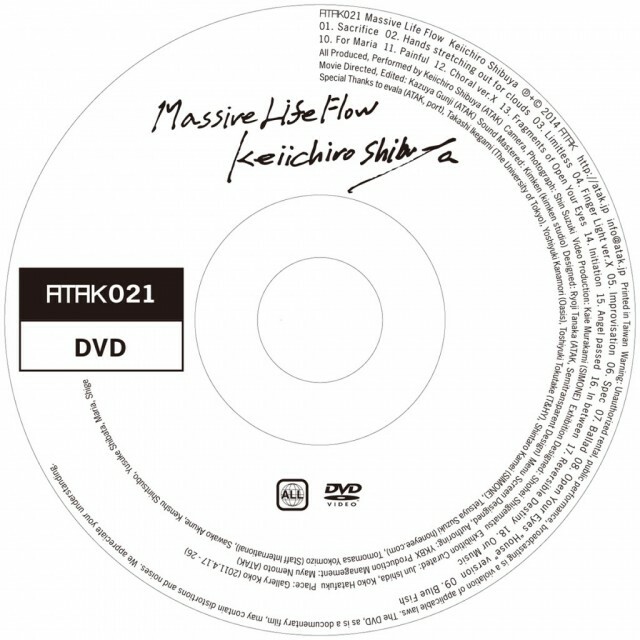 ‘Massive Life Flow’, described by Keiichiro Shibuya himself as a “personal moment of freedom”, shows in extreme close up the real sentiment of performance as well as those momentary flashes where true music is born, by capturing images of “the movements of his hands and fingers as they dance around on the keys, swaying about, filled with emotion and expression”. Shot from multiple angles and projected in real time inside the gallery, the piece shows us the relationship between watching and being watched.